Natural disasters in the United States have practically become part of our everyday lives. It seems like any time we turn on the news, we see that a hurricane has hit the South or a wildfire has spread across the West. We donate, we volunteer, and we try to help—but is that all we can do? Can we predict where disaster will strike? To answer these questions, Move.org decided to study how much natural disasters really impact our everyday lives. 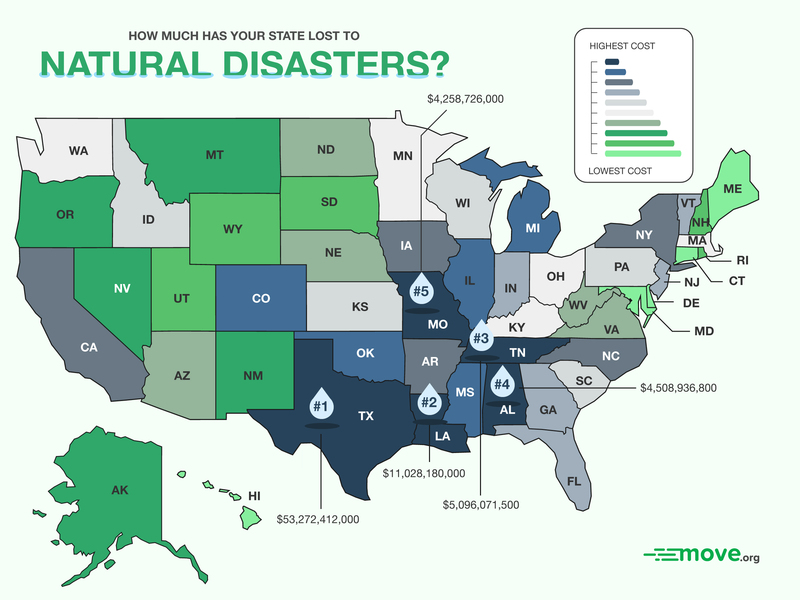 We analyzed how much money each state has spent on property damage from natural disasters in the past ten years to find out which states lose the most. So which state had the most? Texas tops our list for states most affected by natural disasters. While Texas experiences damage from seven of the eight disasters we studied—it appears to be safe from tsunamis—the vast majority of property damage was caused by hurricanes and flash flooding. The two disasters account for over fifty billion of the fifty-three billion dollars in total damages. The infamous Hurricane Katrina wasn’t included in our study (it hit in 2005), but Louisiana still comes in at number two on our list of the states with the most damage caused by natural disasters. Most of Louisiana’s damage came from floods, flash floods, and hurricanes. Despite its high rank, Louisiana experiences far less damage than our number-one state. Even with property damage from flooding reaching billions of dollars, Louisiana’s total costs amount to just one-fifth of Texas’s. Tennessee takes the third spot on our list, primarily because of flood damage. Flooding cost Tennessee over $4 billion—more than seven times the amount spent on tornadoes, the state’s second-most costly natural disaster. Tennessee is the first state on our list without any spending on hurricane damage, meaning residents have to deal with only six of the eight disasters we studied. Alabama comes in fourth on our list, and it’s the first state to buck the flood damage trend. While Alabama has spent millions on flood damage over the past ten years, it has spent far more on tornadoes—over $4 billion—which accounts for 98% of Alabama’s total property damage spending. Like Alabama, our number-five state has large amounts of tornado damage. Missouri spent well over $3 billion on property damage caused by tornadoes—almost four times its spending on all other natural disasters combined. The Show Me State is the first state on our list not to have any spending on snow damage. With no damage from heavy snow, tsunamis, or hurricanes, the state spends on just five of the eight disasters we studied. Our five top-spending states have lost billions to property damage, but these low spenders have paid less than $50 million each over the past ten years. For perspective: Texas spends over forty thousand times as much as Delaware on damages caused by natural disasters. None of these states have any hurricane damage, and four of the five have no tsunami or wildfire spending. In fact, Delaware’s property damages comes entirely from flash floods and floods—$705,000 and $600,000 respectively. Put bluntly, no state is entirely free of natural disasters. Delaware comes close, but it’s also one of the smallest states in the nation, with a population of fewer than one million people. There are many reasons why Americans are moving to western and southern states, but rather than try to move to a disaster-free state, focus on taking steps to stay safe where you live. Know what kind of disasters strike in your area and be prepared for them. If you’re in a wildfire-prone area, have an evacuation plan. If you live in a tornado-heavy area, make sure everyone in your family knows what to do when they see a funnel cloud. Likewise, ensure you have homeowners or renters insurance—and make sure that insurance covers the natural disasters in your area. Most insurance excludes flood damage, for example.6 If you’re in a flood-prone area, get additional flood coverage. Whether you end up in Texas or Delaware—or any state in between—we can help you move there. Check out our Find-a-Mover tool to find a moving company, and keep reading Move.org for tips on making your move safe and simple. Move.org analyzed the cost of property damage from several types of natural disasters: 1) flash floods, 2) floods, 3) hurricanes, 4) heavy rain, 5) heavy snow, 6) tornadoes, 7) tsunamis, and 8) wildfires between 2008 and 2018. We wanted to see which states topped the list for most money spent on natural disasters.